Here is another completed quilt. The inspiration was the small block with the newspaper clipping,that I received from my Add-a-border group on flikr. I used 'made' fabric for the leaves and the machine appliqued them. That long pieced strip on the left was made from the leftovers of the leaves that I could not bear to throw out! It is big stitch quilted with perle cotton in different weights and hand dyed embroidery floss! Love the colours -such a happy fun piece. Thanks for sharing. Looks lush & tropical ... love the addition of the big stitches which create contrast & movement. 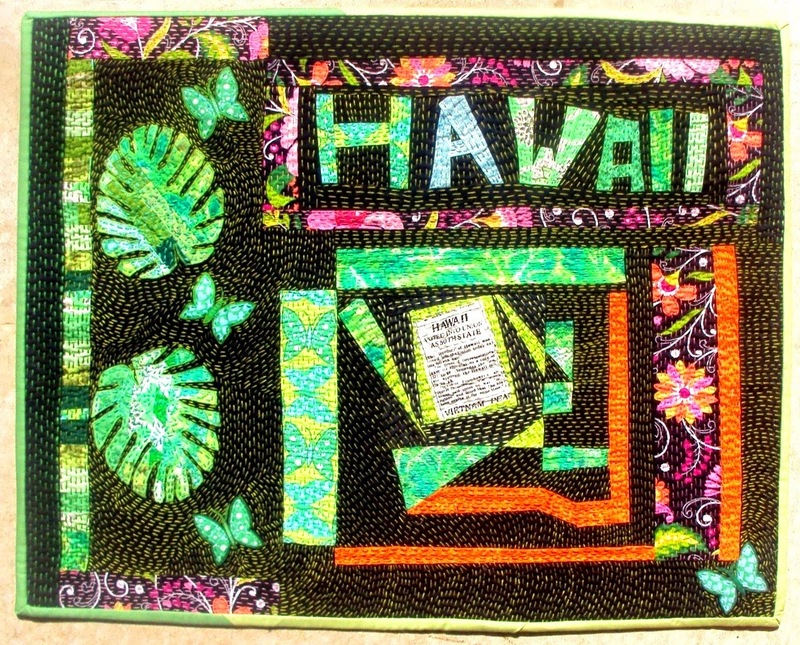 Love the quilt, love Hawaii! This such a lovely colour burst and fantastic design. 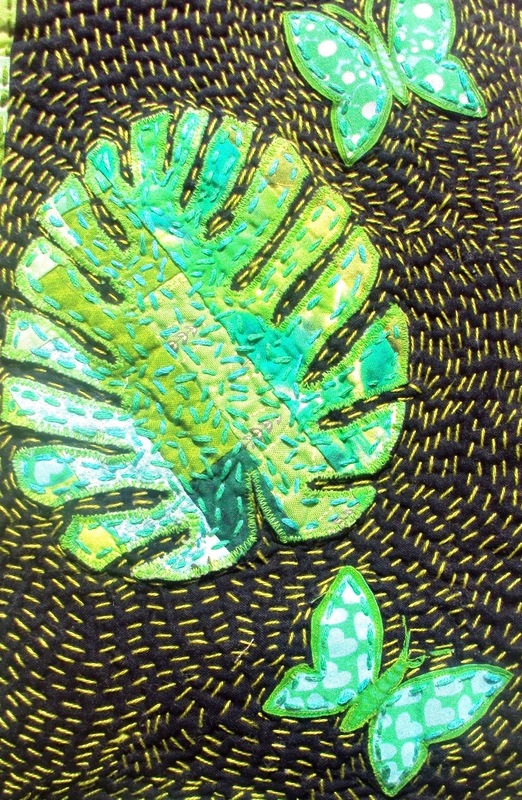 All that Hand quilting is divine! Nice colors and lots of fun. I love the energy in the leaves! This is a good reminder that not all projects need to fit on a bed. Thanks. This is terrific, a happy warm piece for a very cold day here. Love the way you have made the letters for Hawaii, the border round the word, the geometric patterns in the block with the newspaper clipping, the way you have used a restricted range of fabrics to maximum impact and the butterflies. In short, I love everything about it. Oh, and love the leaves too! You all warmed my heart with your wonderfully supportive comments!!!! this was a totally intuitive project and I had some trouble trusting my inner muse at times!!! wow! Love all the hand quilting. Great quilt.